What does the army do with a 41-year-old movie star who wants to serve his country during World War II? 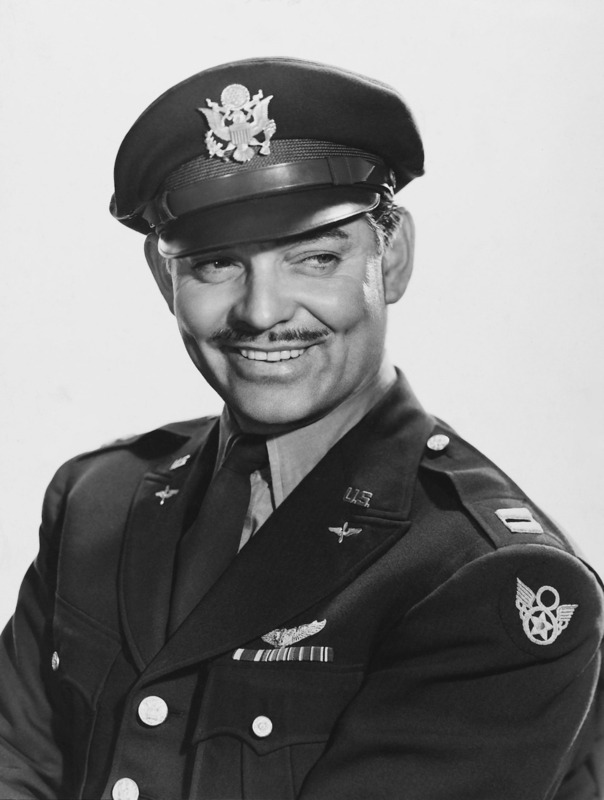 Clark Gable’s wife, Carole Lombard, sold war bonds for the Treasury Department. On the night of January 15, 1942, she phoned Gable from Indianapolis after a record-breaking sales drive. “You’d better get yourself into this man’s army,” were her last words to him. The next day, she died in a plane crash. 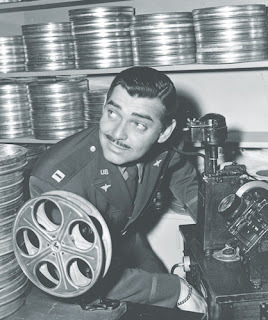 General “Hap” Arnold of the US Army Air Forces proposed Gable make a recruiting film for gunners for the heavy bombers, the B-17 Flying Fortresses and the B-24 Liberators, if he completed Officer Candidate School. First, however, he would have to pass the rigorous physical training and academic exams. Gable was old enough to be most of the recruits’ father. He suffered from hemorrhoids and minor skin disorders, wore dentures, and was a high school dropout. He had to shave off his moustache (which he allowed to press to film) and get a buzz cut (which displayed his ears, which were taped to the back of his head for movie filming because they stuck out prominently). He took his training in steaming hot Miami in August. He passed by using his acting skills. Though not a good student, he memorized mimeographed pages covering the salient points of lectures, as he would a script, and copied it verbatim on exams. Though fatigued by the physical training, he acted fresh and raring to go. To create a film for gunners, he needed to be familiar with their tasks. 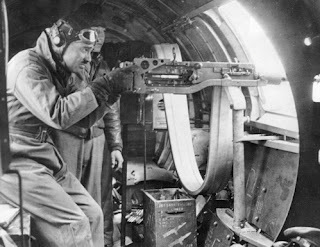 He attended specialized gunnery school and earned an aerial gunner’s silver wings. He joined the 351st Heavy Bombardment Group and brought along his own creative group for his film project. The Group went to England in April, 1943. Whether at bases in the U.S. or in England, Gable was mobbed by women. Civilian women working on base slipped him scraps of paper with their phone numbers. Even men in the army had ulterior motives. A sergeant from Eisenhower’s administrative staff asked Gable to sign a stack of forms, saying they required a captain’s signature. He then cut off the signatures and sold them to British girls. Gable wanted his service to be no different than anyone else’s. He flew several combat missions as a gunner. One time a German shell tore the heel of one of his flight boots. He often took over the guns of wounded gunners. He taught gunnery. Gable and his Hollywood crew were recalled to the States in October, 1943. He was shocked when Hap Arnold told him his film was now obsolete. A recruitment film was no longer needed. Gable could use the footage however he wanted. He created several short documentaries rarely seen. In June of 1944, he requested discharge from the army, citing his age. His application was signed by another movie actor-turned-army-captain, Ronald Reagan. Thank you, Jeanne! Kind of hard to imagine Rhett Butler taking part in the fighting, isn't it? Too bad you couldn't squeak in a sighting of Clark Gable into one of your stories - or at least mention of him. This was probably not the same time that your stories take place though. No, he was in England before my heroes got there. And the wrong base. They did get celebrities at the 381st though. What Happened to the Factories?